(MAR. 29, 2019) CORPUS CHRISTI, Texas - Today, students at Jaguar Valley, a mini city inside Gloria Hicks Elementary, celebrated the grand opening of the first Minitropolis® program in Corpus Christi. Minitropolis® provides students an opportunity to see how a community operates by giving them a variety of real-world positions in mini stores and mini city government. The program was created by IBC Bank in 1996 and currently operates in more than 25 elementary schools across Texas. "The Minitropolis® program prepares students for the social and financial situations they will experience in adulthood," said Harold Shockley, Jr., IBC Bank-Corpus Christi President & CEO. "The interactive environment is an exciting, hands-on learning tool that is unique to educators in our city. We are excited to launch the first Corpus Christi Minitropolis® at Gloria Hicks Elementary and are proud of the students and teachers who have worked hard to create Jaguar Valley." IBC Bank at Jaguar Valley teaches students about the importance of managing their money and skills like balancing a budget, writing checks, making deposits and withdrawing money. All students and teachers were involved in the creation and implementation of the Minitropolis® program. In order to learn the important financial literacy concepts that this program teaches, each grade level worked in the treasury department and IRS, sorting and counting "Jaguar Bucks". In addition to those duties, pre-k through third-grade students managed H-E-B, KDT Radio Station, the postal service, a movie theater and Jaguar Uber. 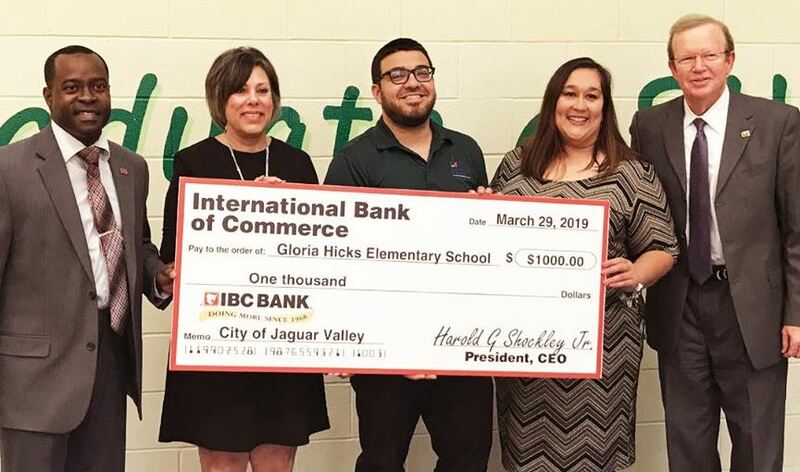 IBC Bank at Jaguar Valley is operated by fourth-grade students, overseen by the bank's student president, Victoria Muniz, and student vice president, Laythan Wilson. Fifth-grade students were elected to City Council positions, including the Mayor of Jaguar Valley and Gloria Hicks Elementary student, Sarah Salinas. "This is an engaging way for our students to learn and apply valuable financial literacy principles to everyday situations that they will carry into adulthood," said Joe Hernandez, Gloria Hicks Elementary interim principal. "Understanding and applying these basic principles at a young age sets our students on a path for success and plays an integral role in their educational growth." Jaguar Valley will be open every Friday for students to practice social, academic and real-world skills. Incentives embedded into the program are designed to increase student attendance and improve attitudes towards learning. IBC Bank-Corpus Christi is a division of International Bancshares Corporation (NASDAQ: IBOC), an $11.9 billion multi-bank financial holding company headquartered in Laredo, Texas, with 189 facilities and 287 ATMs serving 89 communities in Texas and Oklahoma. IBC Bank's slogan "We Do More" reflects the bank's dedication to the growth and success of the customers and the communities it has been serving since 1966. International Bancshares Corporation was ranked 22nd on Forbes' prestigious list of 100 Best Banks in America in 2019. IBC Bank-Corpus Christi was awarded the 2018 Big Business of the Year Award from the United Corpus Christi Chamber of Commerce. IBC Bank-Corpus Christi has been serving the Coastal Bend community since 1995 and has a retail branch network of nine locations. MEMBER FDIC / INTERNATIONAL BANCSHARES CORPORATION. Follow our Facebook page, @IBCBankWeDoMore. More information is available at ibc.com.